A pilgrim has seven words for contemplation: spirituality, carefreeness, sharing, simplicity, freedom, slowness and silence. Whether you are taking all of them or choosing some of them, you will soon find a meditative calm. Capture the variation in the landscape with cultural landscapes, untouched nature, deep forests, Sapmi and the mountains on both sides of the border between Sweden and Norway. In its entirety, the route extends a distance as long as the distance between Berlin and Amsterdam, about 570 kilometers. “There was a strong wind from the ocean when we started our walk at the church in the village Selånger just outside Sundsvall on the swedish coast. 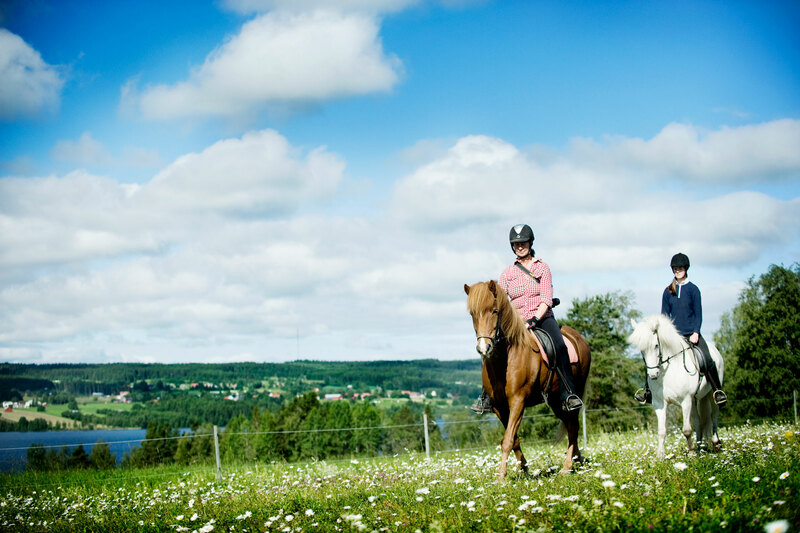 We went through a number of small villages and after five days, when we reached the county border between Västernorrland and Jämtland, we had entered a comfortable pace that suited us all well. We tried to imagine what it was like along this pilgrim route a thousand years ago, through the deep Jämtland forest, where robbers bitterly ravaged. And the enormous relief it must have been to finally reach Bräcke and the overnight shelter. We chose to bring light mountain tents to be able to stay whenever we felt like taking a pause. We found a peaceful place by a small creek to stay overnight and made our evening meals on our Trangia camp kitchens. Thanks to the Swedish Right of Public Access you can stay for a night. The next day we passed through the village of Mordviken (murder bay), which is not as dramatic as it sounds – the name comes from the word mordh, which means forest. The village is situated by the lake Revsundssjön and river Gimån. The village of Revsund is a focal point for pilgrims, as you can choose to continue on the same road that St Olav took over to Norway or go the alternative “Jämt-Norgevägen” trail south of lake Storsjön and into the mountains of Ljungdalsfjällen over to Norway. By Brunflo church we strived to climb the narrow staircase in the defence tower, a k a the bell tower, built in the 1100s. The castle was dedicated to St Olav and the wide view of Storsjöbygden is worth the climb. Not far from the church we all filled our water bottles in one of many cold water sources along the way, all with the same name: St Olav’s source. In Östersund it was time for a day of rest and a visit to Jamtli, a “living history museum” with exhibitions and farm environments from all over the region. The little pilgrimage cottage from Hovdsjö gave us an insight into how medieval pilgrims could stay overnight along the trail. 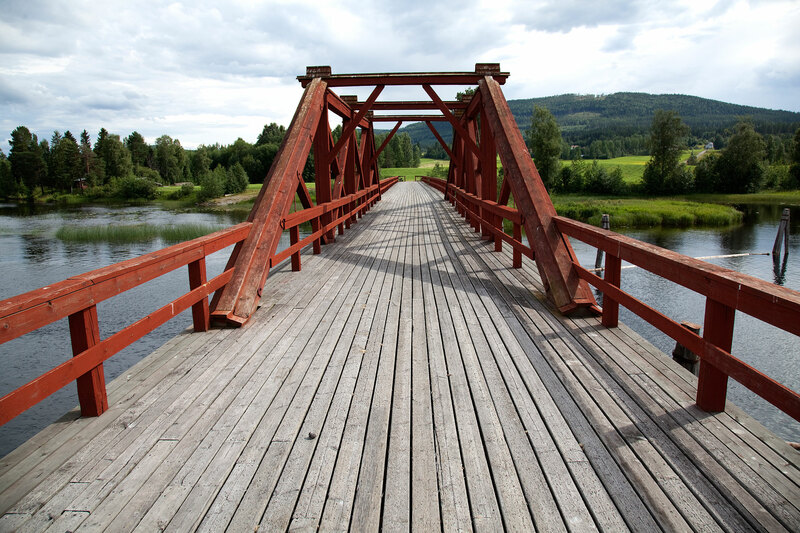 The hike from Östersund to Åre took us a total of six days with stops at some historic sites. We stayed at Frösöns runestone, which tells about Östman who Christianized Jämtland. We crossed the bridge over to Rödön with fertile meadows towards Alsenbygden with a view of Oviksfjällen and Åreskutan. Pilgrimsleden passes right by the Glösa rock carvings with almost 6000 year old pictures of moose and some reindeer. It is difficult to get closer to the Stone Age than the feeling of being so close to their actual marks in these rocks. In Hålland we made a break at the mighty waterfall Ristafallet and another St Olav water source near the pilgrimage center Hållandsgården. As we entered the modern day village Åre the great contrasts between the modern houses and the little medieval stone church struck us all. Inside the church, our curiosity was caught by the medieval sculpture of St Olav with a Carolean hat. The story has it that the crown of the sculpture was stolen some time after 1719 and a former Carolean soldier and carpenter gave it what he thought was as mighty as a crown! Read more on the Carolean campaign here. From Åre the trip continues towards the Norwegian border. We passed Stalltjärnsstugan, Medstugan and Skalstugan, which for long periods have served as overnight stays for hikers and merchants crossing the border. After six days in the mountains with strong winds, we reached Stiklestad on the norwegian side. This is the place where King Olav died in 1030. After Olav’s passing in the battle at Stiklestad, miracles occurred by his corpse and this is what made him canonized and people started making pilgrimages to visit his grave. 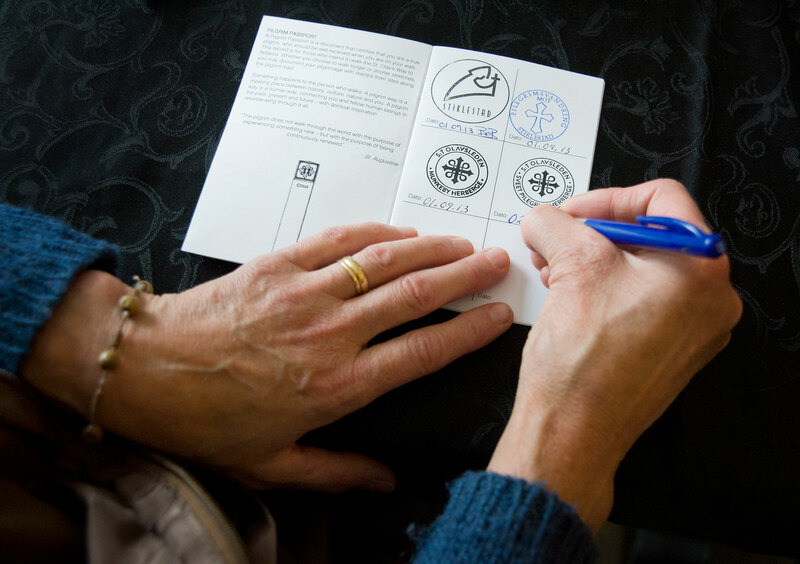 We checked in at the Stiklestad hotel in the magnificent cultural center, took a much needed shower and looked at the exhibitions of Saint Olav and the region’s history. After another seven days of hiking, we finally arrived at Nidarosdomen, the north’s second largest cathedral after Uppsala in Sweden. Nidaros, the current Trondheim, was the Norwegian capital until 1217, and it was therefore natural that St Olav’s remains should be kept there. The year 1070 the cathedral build was started and it was not before the 13th century before you could start calling it finished. Most people who make a pilgrimage do it to find an inner calm and think things through, maybe as a result of a change in their lives. Some do it to get in touch with their spirituality. But the real story of St Olav’s is anything but peaceful. He may be the oldest and most popular saint in the Nordic countries, but the way there was violent. Olav Haraldsson, as he was called, was in the early 11th century a viking who plundered and fought in Sweden, Denmark and England. In battle, he conquered the King of Norway, tried to christianize the people and brought hard cut downs in all kinds of fields. He was forced in exile due to the rebellion this forged. He later returned to Norway with Swedish backing and got stabbed in the battle of Stiklestad in 1030. Many miracles occured near his secret burial place and the church later canonized him posthumously. 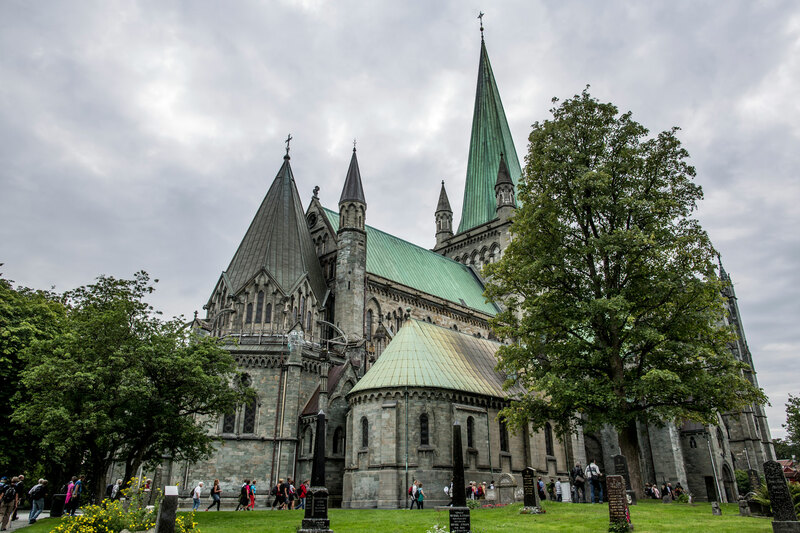 Once the Nidaros Cathedral in Trondheim was built, St Olav´s remains were moved and reburied in the cathedral. During the Middle Ages, Nidaros (the name of what today is Trondheim) was one of the four notable pilgrimages comparative in greatness to Jerusalem, Santiago de Compostela and Rome. 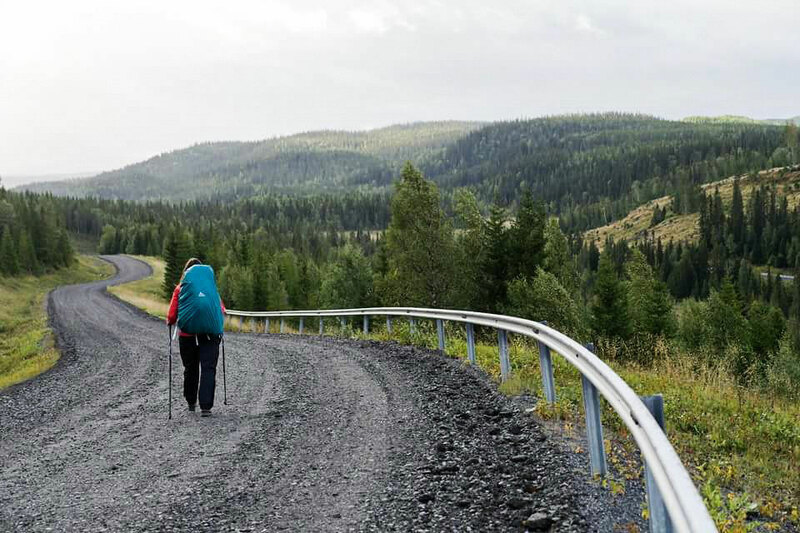 Putte Eby, project leader of the S:t Olavsleden path in Sweden, takes you on a trip along the 564-km-long pilgrim route. This time he visits the starting point of the road: Selånger, near Sundsvall. St Olavsleden is mostly easy to walk, except over the border to Norway. When hiking in the mountains you always need to take extra care as weather changes quickly. 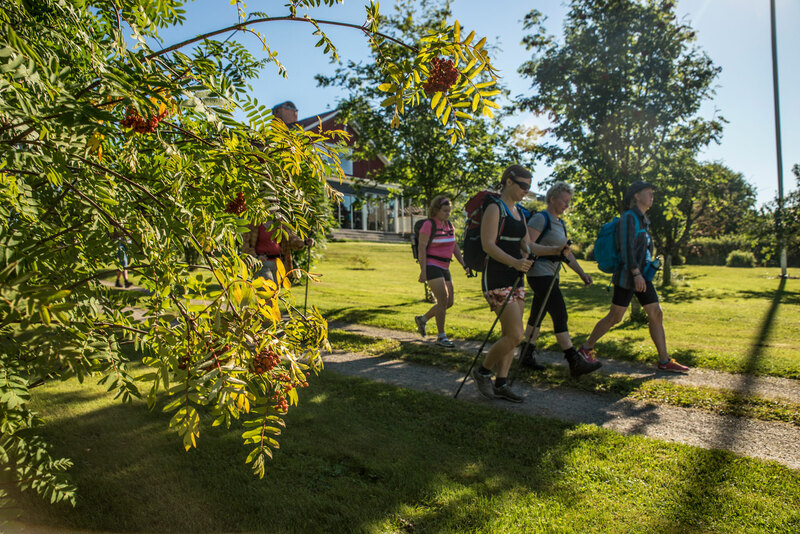 The lowlands and mountainous areas bloom from June to September and during the latter part of summer there are plenty of berries and mushrooms to pick along the way (see Sweden´s right of public access). Between November and early May, parts of the trail are snow-covered. The signage is only made to face hikers or cyclists heading west towards Nidaros, which can be good to know if you plan on going on the trail “backwards”. The dangers threatening the medieval pilgrims to life were cold, hunger, diseases, robbers and wild predators. Today this hike is a very safe hike and you are lucky if you get to see animals along the way such as wild foxes, moose, beavers, deer and in the mountains, the Sami reindeer. Do not make any sudden movements if you like to get a picture of an animal and do not come too close. Keep track of the weather. At northern latitudes, summer temperatures can give temperatures up to thirty degrees Celsius. At the same time, in the mountains, it is possible to get caught in winter weather with occasional snow in the middle of summer. A pilgrim needs clothes and shoes for all weather conditions. Hiking boots if you are going to go over the mountains. Airy shoes for the lowland. Complement these with sandals for warm weather or as slippers in your accommodations. A wind and water resistant shell jacket in a functional material and reinforcement garments outside of a quick-drying underbody works well during wet, cold days. Hotter days, it may be nice to wear shorts, linen and a sun hat. Band aid for blisters, wool socks with different thicknesses, functional fabrics and an outer shell resistant to rain and wind, swimwear, light towel and a light sleeping bag. You can buy food along the trail in stores, at gas stations and in restaurants. Over the mountains you need careful planning as the distances between the stores are longer. Go for dehydrated foods to save weight. The water in the mountain streams are ok to drink. Along StOlavsleden trail there are hundreds of places to stay, ranging from simpler rooms and cabins to hotels. There are those who walk in simplicity, like a true pilgrim, who choose to stay overnight in wind shelters or with someone who they are invited to. You can bring a tent to be able to rest were suitable, reed more about the Swedish right of public access. In the mountain area we recommend a really good mountain tent with absid and good ventilation. To carry out a pilgrimage like this meant walking through woods, along asphalt roads, gravel roads and pastures. The month of hiking exposed me to all kinds of weather except snowfall. Some days there was such heavy rain, no outdoor clothes would ever endure to hold the water out! And on other days the sun cast it´s golden light between the branches in the wood filling me with it´s eternal beauty and feeling of being part of something larger than life itself. I was overwhelmed by the people I met along the St Olavsleden trail. I prepared for a hike alone in the Swedish countryside. But I met a trail family. People living alongside the trail inviting me and my hiking partner for coffee, or dinner, or staying the night. Talking hours and hours together. Strangers feeling like neighbours. People choosing another lifestyle, people moving from larger cities to live close to nature and in pace with nature. Bringing up their families. They all inspired me in their own special way. Showing warm hearts, giving what they had, giving their time. The trail to me was a lot about people meeting people, just as they are. No boundaries, no fear and no need for keeping masks. During my hike I learned how to let go – let go of everything, even things I didn´t know anything about. Let go of all fears – like not knowing the way and not knowing what the next day would bring in terms of companionship together with the trail and sourroundings. I learned how to appreciate and embrace the unknown. I felt safe all the way thanks to all the lovely people I met. The woman who gave me water when I accidentally (pre-coffee) walked out without refilling my waterbottles. Along the way, I was greeted with open arms, by strangers who saw a backpack going outside the fence, invited to coffee at the kitchen table, learned about the area and its history. To hike The St Olavsleden trail was about meeting nature, culture and above all meeting myself. For this experience I am forever thankful – because it became the starting point for something truly life changing. When I got back home after a month on the pilgrim trail I quit my day job and today I run my own business and live a life closer to nature. Inspired by all the people I met along the trail. I am profoundly sure that I have everything I need within me. Every day. One step at the time. Just as I made it along the Olavsleden trail. Every step I have to take on my own, but never alone. Hiking or cycling the whole way from coast to coast is a dream for many, while others enjoy going for a day trip or a few. It is possible to travel along most of the route as a complement to hiking. 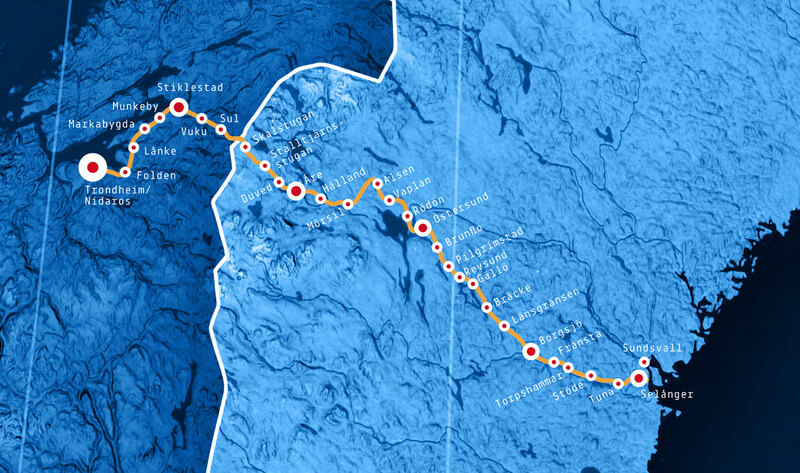 The railroad follows the trail on the Swedish side, from Sundsvall in the east to Duved in the west, and then the trail goes separate from the railway over the mountains and meets with the trail again by the norwegian coastline. From the final destination Trondheim, trains leading to Stockholm will pass Östersund and Sundsvall or if you prefer, you go to the capital of Norway, Oslo. From Trondheim / Vaernes airport there are direct flights to a large number of places. The relay race, which borrowed the name of the Norwegian king St Olav, lasts four days and starts alternately in Östersund on the Swedish side border and Trondheim in Norway every other year. In 2017, the race celebrated 30 years with a new stretch that largely follows the original pilgrim trail. The race attracts over 650 participants who run different stretches of the total stretch of 340 km. In addition to the runners there are a large number of spectators and organizers who contribute to the positive atmosphere around the race. Visit stolavsloppet.com for more information.